When it’s chilly outside, sometimes a chilly treat is all you need. In the arena of small batch local vendors out there, one standout in particular is The Galley Ice Cream in Cambridge, MA. Founder, Kelly Williamson started churning her quality and creative ingredients in her galley-style kitchen almost a year ago and has been playing around with various techniques and flavor combinations ever since. Kara and I are thrilled to feature the ice cream of a like-minded entrepreneur who is passionate about her craft, influenced greatly by her surroundings, and coincidentally grew up in our small town, Manchester-by-the-Sea. Kelly’s inspiration for such standout flavors as Coconut Cajeta, Banoffee Pie, Malted Vanilla Bean, Lemon Curd and Magic Bar comes from a myriad of places. She looks to her friends and family, various articles, television shows and even daydreams (Kara and I can relate to that!) for ideas. One night in particular, Kelly couldn’t sleep so tuned into The Mind of a Chef series on PBS and April Bloomfield was making an English classic, Banoffee Pie. She instantly grabbed her notebook from her nightstand and jotted down a rough recipe. When Kelly begins the ice cream-making process, it usually takes about two days. On the first day, Kelly will start with the base and prepare any of the mix-ins. The base then chills overnight so it can age and develop flavor. On the second day, churning begins and takes under an hour, and then the custard goes back into a very cold freezer to harden for at least a few hours longer. Once the waiting game is over, it’s time to delve in. I had the pleasure of sampling Peppermint Bark this past weekend. At a friend’s holiday party in Cambridge, in lieu of beverages, I decided to bring some of The Galley Ice Cream-inspired treats. The Peppermint Bark flavor is super creamy with a minty twang, rosy hue, and big chunks of chocolate peppermint bark. 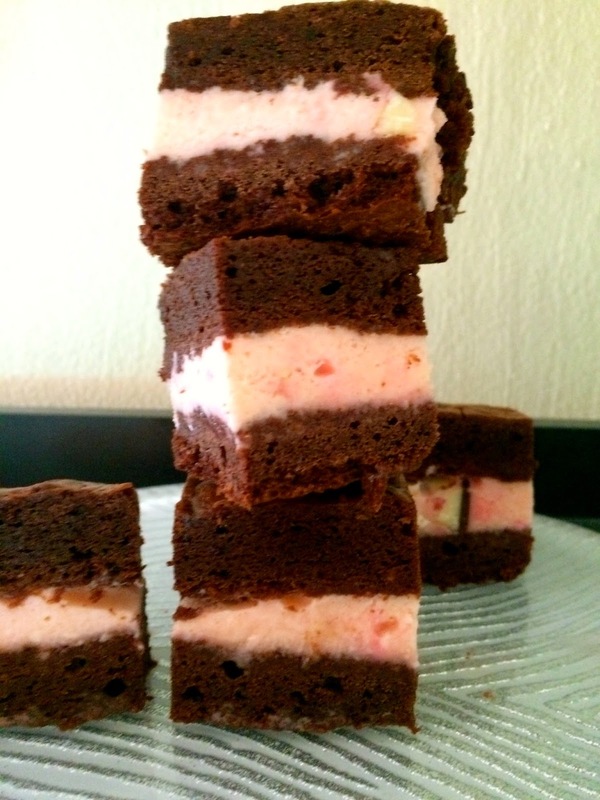 Since peppermint and chocolate are a dynamic duo, I sandwiched the ice cream in between rich layers of fudgy brownies. Kelly’s ice cream truly stole the show at the party. Slide the brownies out of their pans. Spoon the Peppermint Bark Ice Cream on top of one of the brownies. With a knife or spatula, spread the ice cream evenly atop the entire brownie surface. Place the second set of uncut brownies on top of the ice cream layer and press down lightly. Wrap the layers in aluminum foil and return to the freezer for at least 1 hour. Remove the layers from the freezer, remove the aluminum foil, and with a sharp knife, cut the layers into thick squares. Dust with candy canes. Makes 22-24 ice cream sandwiches, depending upon your size squares. To sample The Galley Ice Cream’s fun flavors, email thegalleyicecream@gmail.com to place an order or send a message via The Galley Ice Cream Facebook Page (https://www.facebook.com/thegalleyicecream).